An abscess is an infection in or around the tip of the root of the tooth which may or may not be painful. It occurs when the pulp, the nerve inside the root canal, dies and becomes inflamed or infected. The most common symptom of an abscess is an ache in the bone around the tooth, but you may also experience pain when biting. It also may result in swelling of the gums. 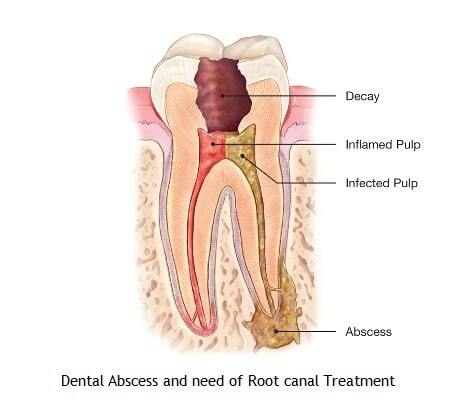 A dental abscess is usually treated with root canal treatment. Root Canal Treatment (Endodontic treatment) is the last try to save a tooth as a functional part of our chewing organ and is necessary when the pulp becomes inflamed or infected. The inflammation or infection can have several causes: a deep decay, frequent dental procedures on the tooth, fracture, faulty crowns or a crack or chip in the tooth. Furthermore, trauma to a tooth may cause pulp damage even if the tooth has no visible chips or cracks. If pulp inflammation or infection is left untreated, it can become painful or lead to an abscess. Aim of root canal treatment is removal of the inflamed or infected pulp and cleaning, disinfecting of the inside of the tooth. Then root canals will be filled and sealed. Afterwards, the top part of tooth is restored with a crown (best practice) or filling (as a temporary) for protection. After restoration, the tooth continues to function like any other tooth. Endodontic treatment helps you maintain your bite and natural smile. With proper care, most root treated teeth can last for many years.